Ellen started teaching in Delta at the Delta Community Music School 13 years ago and 12 years ago began teaching at her home studio. In those years, she has had the opportunity to coach chamber groups with the Delta Youth Orchestra, the Surrey Youth Orchestra, and the Vancouver Youth Orchestra. 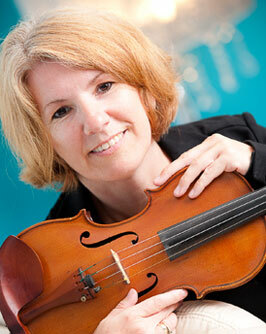 Ellen has also conducted string programs at Semiahmoo Secondary School and with the Surrey Youth Orchestra. For the past 20 years, her playing experience has included orchestras such as the Toronto, Vancouver and Abbottsford symphonies as well as the Canadian Opera Orchestra, the Vancouver Opera, the CBC Radio Orchestra and North Shore Sinfonia. Ellen uses teaching materials from Shinichi Suzuki, C.P. Herfeurth (A Tune A Day) and the RCM Exam books. Ellen strives to encourage a life long love of music in all children, regardless of abilities.